A warning to auto manufacturers that don't take small cars seriously! 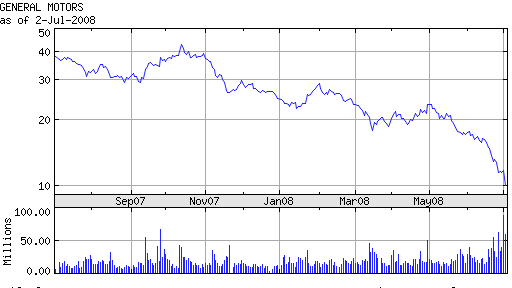 I don't mean to pick on GM when it is down (look at that very sad stock chart! ), but their situation is so clearly small car related... In fact, I would not be surprised if the course of GM over the last few years becomes a classic case study for future business students. Not counting sports cars, nor cars like the Vibe, G5 or the Cobalt -- which GM classifies as "small" on its web site, but which are truly low end mid-size cars -- their only true small, fuel-efficient automobile for sale in North America was the hatchback Aveo5. It's a decent car, but the problem is that GM doesn't make any significant profit on it. GM's R&D division has churned out the Chevy Volt, a valiant attempt at a smallish, plug-in electric hybrid car. The problem is GM has been dragging it's feet at actually releasing it. Americans would not be able to buy it before 2010, at the earliest. Why has it taken so long? The business acumen of GM headquarters needs to be questioned when we consider that there was a 1998 prototype version of the EV1 (GM's previous electric car prototype from the early 1990's) with a hybrid motor configuration, that had four seats (unlike the first EV1, which only seated two), and the same all-electric range of 60 km as the Volt. In contrast to the current Volt, this car was actually a running prototype. Not to mention that the turbine could run on many fuels, from gasoline to compressed natural gas. 10 years onward and they're still at the prototype stage, possibly even one step behind where they were in 1998. GM's factories are not as flexible as those of some of its competitors (e.g., Toyota); they are extremely model-specific. So, even if GM had a larger offering of smaller cars, or if they decided to massively push the Aveos, it would take them over a year and hundreds of millions of dollars to retrofit existing plants. For now, GM is burning through over a billion dollars a month. We'll see what the geniuses at the top come up with now. Bankruptcy is more than just "not impossible" (quoting Merrill Lynch analyst John Murphy in his statement today), in my opinion, it's getting increasingly likely every day. The best case scenario for them right now would be for a white knight firm to come buy them out and force their hand at making the tough, yet obvious, decision to "go small". GM just announced this morning that they will be closing 4 truck production plants, including the one in Oshawa, here in Canada. In addition, some SUV plants will also be shut down. Full details are available in the news release placed online just over an hour ago. Perhaps we could finally be seeing a peak in large vehicle sales in the U.S., eventually to be overtaken by smaller cars. Here in Canada, small cars already appear to be on track to passing larger vehicles (see related post here). The news release also mentions that GM is definitely going ahead with their electric vehicle (the Volt), with a target of having it in showrooms in the United States by 2010.